Franklin County Prosecutor Ron O'Brien talks to some observers before the Parole Board hearing on Wayne Keith Henness. The state parole board has unanimously recommended Gov. Mike DeWine not stop the execution of a man convicted of killing his substance abuse counselor in Columbus in 1993 and taking his car, credit cards and wedding ring to get money for drugs. Wayne Keith Henness has argued his trial defense team was inadequate. David Stebbins with the Ohio Public Defender’s Office made that case to the parole board. 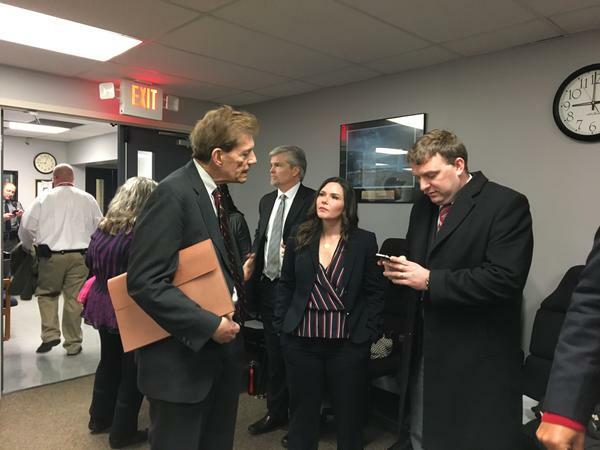 “Evidence was not presented to the jury because counsel did not conduct an investigation into the state’s case, the state’s witnesses, or any of the explanations that Keith had provided," Stebbins said. But Franklin County Prosecutor Ron O’Brien said that’s Henness’ own fault. “Mr. Henness has told a different story at a different time and a different place each and every step along the way," O'Brien said. The parole board agreed, and also said Henness' claims that he didn't shoot Richard Meyers were not persuasive and that Henness is not significantly impaired by mental illness. They recommended Gov. Mike DeWine allow his execution to go forward next month.